An ace performance by the Britten Sinfonia and James MacMillan at their Norwich concert last night provided much food for thought. Centrepiece of the programme was James MacMillan's new oboe concerto which confirmed that having something to say is more important than conforming to a fashionable musical 'ism'. A forward looking yet sombre central slow movement was followed by an extrovert finale that could only have come from the composer of Veni, Veni, Emmanuel. The new work was passionately advocated by Britten Sinfonia co-founder Nicholas Daniel who has done so much to extend the oboe repertoire. It was illuminating hearing members of the audience talking about the concerto after the performance. Most of them were there for the Beethoven rather than the MacMillan. But the consensus was that new music can be true to itself without making the audience run a mile. However, it was the second half performance of Beethoven's Second Symphony, superbly conducted by James MacMillan incidentally, which really set me thinking. Regular readers will know I am a big fan of the Britten Sinfonia. But that is not going to stop me enthusing about the quality of the sound they produced last night. The Britten Sinfonia is an ensemble of outstanding musicians who combine exemplary technique with an absolute respect for the score, and this was small band Beethoven, six first violins and four cellos. But the sound, oh the sound... there was a precision, an attack, but above all a visceral quality and slam which is so rarely heard these days in live classical music. The Britten Sinfonia played precisely what Beethoven wrote, but the tightness of the sound was reminiscent of a very good rock band. Which takes us to the subject of younger audiences. Sound quality may just be the Holy Grail that will lead young people back to classical music. Sound quality matters: Jeff Harrington's provocative proposition here that classical music needs more bass generated a massive readership and was linked by influential sources such as NPR in the States. It may just be semantics, but last night left me wondering whether classical music needs more slam rather than more bass. Which takes us to amplification and acoustics. The Britten Sinfonia's concert was in the Theatre Royal, Norwich and I have previously mentioned the 'Carmen' electro-acoustic sound enhancement system developed by the French research centre CSTB that was installed in the multi-use auditorium in 2007. Only three venues in the UK currently have this system which uses digital technology to create reverberation in naturally dry halls. At this point one thing should be made very clear. The Britten Sinfonia do not need sound enhancement to make glorious music. But that does not stop us learning lessons from last night's concert. From my seat last night in the second row of the circle the sound was glorious. But to my well trained ears it was also a slightly larger than life. But wait a moment, what does the word 'life' mean in that statement? What exactly is the 'natural' sound' we should be using as our reference point? What we hear in any concert hall is a mix of direct sound from the performers and a large amount of reflected sound bouncing off the structure, furnishings, audience and everything else in the hall. Each hall's unique sonic 'signature' is created by the reflected sound which is an integral part of the performance experience. But those reflections change the quality of the sound as well as delaying it. Some materials, particularly human bodies and furnishings, absorb certain frequencies while other harder surfaces simply reflect them. Which means every single hall changes the sound of the performers to a noticeable extent and way beyond simply adding reverberation - for concert hall think graphic equaliser with the sliders randomly adjusted. There are only two places that the 'natural' sound of performers can be heard: in an anechoic chamber and in the open air. These are totally 'dry' venues because there is no reflected sound. And everyone knows that acoustically dry venues are unpopular with audiences. Which is why enhancement systems are being installed in venues such as the Theatre Royal, Norwich. The science (or art?) of concert hall acoustics has gone through three phases. Until the mid-20th century chance, in the form of available construction materials, determined a hall's sonic signature. From the mid-20th century until very recently architectural design and choice of construction materials were used to acoustically tune concert halls, with mixed results. We are now entering the third phase, where tuning the sound using bricks and mortar is being replaced by digital tuning, as in the Theatre Royal, Norwich. The importance of this third phase cannot be underestimated. Acknowledged masters of the second phase of concert hall acoustics were Arup Associates, whose work included creating the legendary Snape Maltings acoustic. Arup Associates are also responsible for the just completed acoustic reworking of the Waterside Theatre in Aylesbury. And how did Arup transform that venue's acoustic? With bricks and mortar? No, with a custom CSTB electro-acoustic enhancement system. Elsewhere I have written about how digital reverberation is an integral part of ECM's acclaimed 'natural' sound. We accept it on disc, and, whether we like it or not, it will become standard in the concert hall. It is also important to note that Britten Sinfonia audience research at the Theatre Royal, Norwich gives a unanimous thumbs-up to the 'blasphemous' new sound enhancement system, even from older concert goers. Jonathan Harvey's proposal for amplified classical music needs closer examination. He did not mean stacks of Grateful Dead-style bass bins. He meant leveraging digital technology to provide the slam that young audiences want. At this point let's head off some of the comments. Yes, great recordings playing through great audio systems provide slam without digital processing, as do great performers in great halls. But how many can listen under such conditions? Classical music can learn a lot from the brave use of new technology at last night's Britten Sinfonia concert. Digital sound enhancement tools applied to concert halls could be the key to bridging classical music's audience gap. * Judge the Britten Sinfonia yourself this evening without any digital enhancement. BBC Radio 3 is broadcasting the Shostakovich/Barshai, MacMillan and Beethoven programme, recorded in Birmingham Town Hall, tonight (Oct 21) at 7.00pm UK time. I just started following your blog so I missed out on the last post about adding bass to classical music but I can remember going to my first opera at the Met and being thoroughly underwhelmed. 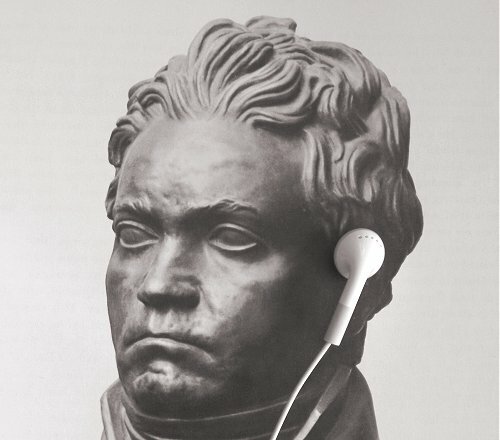 I grew up on rock, hip-hop and electronic music and, while I knew classical music wasn't amplified, I didn't expect it to sound like a distant murmur. Granted, I was in the cheapest seats in the place but that's because it was all I could afford and probably all any curious music fan would be willing to shell out to see what an opera is like for the first time. So, I asked on a forum of composers whether it would be beneficial for classical music to go amplified, w/o giving my opinion. The response was astoundingly negative. I felt as though I had just made a joke about their mothers. One person even claimed that it's better to not be amplified because it allows them to figure out who's a good singer and who isn't, relating a story about how a poor singer ruined an opera he recently attended. Do we really want to sit through terrible performances just so we can decide who's good? It's a silly method anyway. Pop music fans know when a singer is good or not, how do they do it if it's only possible without amplification? There are definitely plausible ways to add it in and create a better experience for people, especially underwhelmed new fans, that doesn't destroy the delicate dynamics that the genre requires. I think this is the fear that stops it from happening. Hope you don't mind the length. JoshMc, welcome to the path and thank you for your thoughtful contribution. I have to confess that until recently I was dismissive about the use of amplification in classical music. But two things have made me rethink that position. First people like Jonathan Harvey, whose opinion I respect hugely, are saying we need to question classical music's performance conventions. Classical music should never sound like "a distant murmur." We need to understand what electro-acoustic sound enhancement systems can offer before we dismiss them. Britten Sinfonia are wonderful. I went to a performance of their program with Pekka Kuusisto of music by Purcell gently rearranged by Nico Muhly at the Concertgebouw. Tight playing and a "transparent" sound. Some ensembles sound woolly, that was certainly not the case here. As for distant murmur, that has never been my experience. I did go to a Prom this year and was a bit amazed about the sound quality which was awful compared to Amsterdam. But perhaps I'm spoiled. Hi, Pliable - Always really appreciate it when you talk about audio/acoustics. It's so crucial to the musical experience and so little written about. This post tops the list, though. I think you're really on to something here. There's a text I bought years ago trying to figure out audio and it was called "Sound Reinforcement" and the introduction talked about how what you really want to do is enhance the natural sound, not crank everything up to eleven. Sounds like the professionals have been pursuing that notion and have really refined it with the new digital possibilities. But the best thing about this post is "slam". That's just a terrific and very handy way of talking about how to engage an audience. Looking forward to seeing where this path will lead. This reminds me of a recording of Beethoven's Fifth with Peter Eötvös conducting the Ensemble Modern that is close-miked and mixed to really maximize the sonic punch. One of my more favorite versions of the Fifth out there. One trade-off I've always noticed about unprocessed sonic slam—maybe because I'm too damn tall—is that it tends to come at the cost of audience comfort. Letting the orchestra off its leash in Symphony Hall in Boston has resulted in some of the most viscerally overwhelming waves of noise I've ever experienced, and it's in part because all the seats are hard-edged, seasoned wood things that kill the back. Slam, that's what I've always called 'Oomph'. This reminds me of a discussion I had about 10 years ago on an electronic music forum where they were discussing the use of parametric compressors. I remarked that the way that composers in the past made bands of music louder was through orchestration, and in the way they voiced their chords. I used as an example how Beethoven could take a Haydn-sized chamber orchestra and make it seem like the gates of heaven were opening merely be cleverly arranging his chords and instruments in such a way that the power distribution created an effect of loudness and possibly even an effect of more instruments than there really were. The guys on the forum were very interested in this, and this started a discussion as to how a composer, even one using purely electronic means, could make their music louder in bands by chord voicings. I called it a kind of 'acoustic compression'; compression by non-electronic, merely musical means. Of course, you've been suggesting ways that a conductor can produce increased 'Slam' by his musicianship. But there has to be the desire to make music more visceral. That has to come first!